Prismatine and Ferrohogbomite-2N2S in Granulite-Facies Fe-Oxide Lenses in the Eastern Ghats Belt at Venugopalapuram, Vizianagaram District, Andhra Pradesh, India: Do Such Lenses Have a Tourmaline-Enriched Lateritic Precursor? Fluorine-rich prismatine, (square,Fe,Mg)(Mg,Al,Fe)(5)Al-4(Si,B,Al)(5)O-21(OH,F), with F/(OH+F) = 0.36-0.40 and hercynite are major constituents of a Fe-Al-B-rich lens in ultrahigh-temperature granulite-facies quartz-sillimanite-hypersthene-cordierite gneisses of the Eastern Ghats belt, Andhra Pradesh, India. Hemo-ilmenite. sapphirine, magnetite, biotite and sillimanite are subordinate. Lithium, Be and B are concentrated in prismatine (140 ppm Li, 170 ppm Be, and 2.8-3.0 wt.% B2O3). Another Fe-rich lens is dominantly magnetite, which encloses fine-grained zincian ferrohogbomite-2N2S, (Fe2+ Mg,Zn,Al)(6) (Al,Fe3+,Ti)(16)O-30(OH)(2), containing minor Ga2O3 (0.30-0.92 wt.%). Fe-Al-B-rich lenses with prismatine (or kornerupine) constitute a distinctive type of B-enrichment in granulite-facies rocks and have been reported from four other localities worldwide. A scenario involving a tourmaline-enriched lateritic precursor affected by dehydration melting is our preferred explanation for the origin of the Fe-Al-B-rich lenses at the five localities. Whole-rock analyses and field relationships at another of these localities, Bok se Puts, Namaqualand, South Africa, are consistent with this scenario. Under granulite-facies conditions, tourmaline would have broken down to give korner-upine-prismatine ( other borosilicates) plus a sodic melt containing H2O and B. Removal of this melt depleted the rock in Na and B, but the formation of ferromagnesian borosilicate phases in the restite prevented total loss of B. 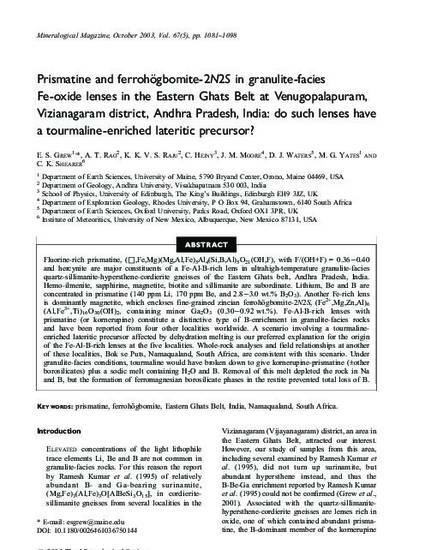 Grew, ES, Rao, AT, Raju, KKVS, Hejny, C, Moore, JM, Waters, DJ, Yates, MG, et al., 2003, Prismatine and Ferrohogbomite-2N2S in Granulite-Facies Fe-Oxide Lenses in the Eastern Ghats Belt at Venugopalapuram, Vizianagaram District, Andhra Pradesh, India: Do Such Lenses Have a Tourmaline-Enriched Lateritic Precursor? : Mineralogical Magazine, v. 67, p. 1081-1098.